To review the students who have applied for graduation, log-in to my.UChicago and click on Graduation Processing under My Workcenters. From here, you can use the navigation pane on the left hand side and click on Graduation Tracking Search. You can use the Graduation Tracking Search page to easily filter your student search by using select Search Criteria. In order for the search function to work properly, you must enter in the Academic Career. 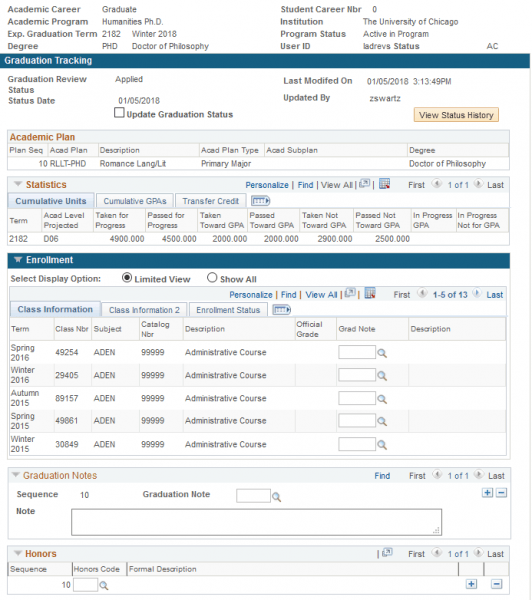 You can continue to filter your search by using additional fields such as Academic Program and Expected Graduation Term. To save your search criteria for future use, you can click on Save Search Criteria at the bottom of the search page. You will be prompted to Save Search As and will need to create a Search Name. 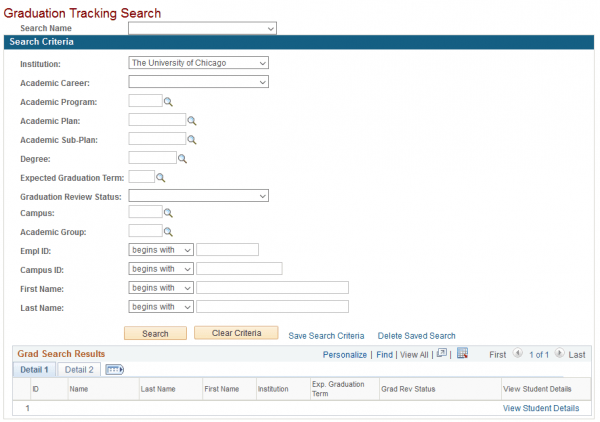 Enter in the name of your search and when using the Graduation Tracking Search in the future, you can use the drop down menu at the top of the search page to toggle between your favorite and most frequently used searches. Once you have entered in your Search Criteria and you click on Search, a list of students matching your criteria will be returned. From this page, you can easily review the students Grad Review Status as well as have the ability to review the students record in more detail by clicking on the View Student Details hyperlink next to each student. When students first apply, they will have a status of Applied until the status is updated by an administrator. 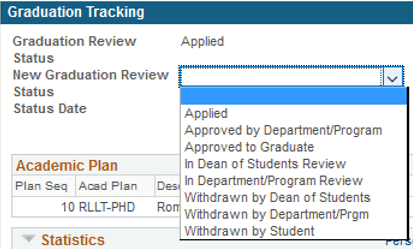 Once you have reviewed the student’s academic record and you would like to update the student’s Graduation Review status, you can click on Update Graduation Status*. *Students with a Graduation Review status of Applied, Approved by Department/Program or Approved to Graduate will be an indicator to the Office of the Registrar that student is eligible to have their degree awarded when it’s time to post the degree.